I can’t embrace the mantra, “Think globally, act locally.” Once we start thinking globally, it’s hard to constrain ourselves to acting only locally. Still, incredible things are happening in the Middle East, and here we are, most of us unable to leave Lancaster to hang out in Egypt for a while. It looks as if I may have to be content acting locally after all, even as my thoughts are elsewhere. So where should our minds be at this historic moment? How should we be acting in response? Here are my initial thoughts. The popular uprisings in the Middle East are massively important and of lasting significance. In Egypt, the military (which is in control until elections are held, months from now) will be unable to wrest real power from the people. The people are too energized, informed, and coordinated. So far, the indications are that the military realizes this. They’ve already convened a panel to rewrite the constitution. Across the entire region, the zeitgeist has changed radically. Tunisia inspired Egypt, which is inspiring Yemen and Bahrain. Iranian supporters of the popular opposition in Tunsia and Egypt gathered yesterday to celebrate those countries’ victories, but when as many as 350,000 people turned out, they couldn’t help but revive their aspirations for a free Iran. We need to get on “the right side of history,” as many are saying. Here’s what we mean by that: People are meant to be free. Each of us is born with inherent worth and rights. Totalitarian rule, communism, and fascism ignore that worth and deny those rights. Self-governance is the only viable option for guarding those rights and making room for all individuals, families, and communities to reach their full potential. When the natural order of things is constantly steering history toward freedom and democracy, oppression is an uphill battle, always doomed to eventually fail. The Muslim Brotherhood will be a political party, not a ruling oligarchy. The message coming out of Cairo will be: We tried Nasserism; we tried Islamism; and now we’re trying democracy. But not democracy imported from Britain or delivered by America — democracy conceived, gestated and born in Tahrir Square. The chance that Islamists will capture the Arab uprisings is slim unless anti-democratic, oil rich Arab dynasties like the Saudi and other Gulf monarchs, or their Iranian rivals, are allowed to pour billions of dollars into the coffers of their respective proxies, as they did in Gaza, Lebanon, Pakistan, and Afghanistan. The West can prevent this from happening, but even if it does happen, whoever seizes power in the countries in revolt will be forced to remember the fate of the ousted rulers they replaced. Judging by the images of Egyptians cleaning up after their uprising, I think it’s fair to conclude that they are ready for democracy. My belief that we’re looking at permanent change in the Middle East is due in large part to my understanding of technology. To understand modern life, it’s requisite to grasp the concept that technology is not morally neutral. Different technologies are predisposed to certain uses. Broadcast television is predisposed to addressing the least common denominator—on TV, success is easier and greater if you’re dumbing things down than if you’re trying to raise the level of intelligent discourse. Automobiles are predisposed to increasing individualism and isolation—with a car, you’re far more independent and can live further from the people who know you. In this way, technology in the form of television and automobiles is not neutral. It’s not just “what we make of it,” because different technologies lend themselves to certain uses. In the same way, the Internet and mobile networks, along with the social technologies that are built on them, are not simply “whatever people make of them.” Saying that it’s up to people to decide whether or not they’ll use Facebook and Twitter to organize revolutions is like saying it’s up to people to decide whether or not they’ll use a hammer to drive in nails. Facilitating discourse is what social techologies want to do, in the same way that driving nails is what hammers want to do. Facebook, Twitter, e-mail groups, and text messaging systems want to be used to facilitate discourse among empowered citizens. The people of Tunisia, Egypt, Yemen, Bahrain, and Iran have a lot to talk about—specifically, decades of frustrations and aspirations they’ve been unable to express or pursue. I dare you: arm an entire nation with hammers and try to keep them from hammering stuff. Arm an entire nation with social technologies and try to keep them from talking about freedom, organizing protests, and establishing self-governance. Just try. The imperiled despots in the Middle East are rushing to block these networks and communication platforms. That tactic won’t work—people will be infuriated, and a complete shutoff is impossible. In some ways, President Barack Obama did the Egyptian revolution a great favor by never fully endorsing it and never even getting his act together for how to deal with it. This meant in the end that Egyptians know they did this for themselves by themselves – with nothing but their own willpower, unity and creativity. The first problem with the U.S.’ foreign-policy approach with these states is that you can’t just count on unpopular regimes staying in power forever. And the second problem is that the longer the U.S. government stays in bed with kleptocrats, the more severe popular discontent against the United States becomes. It’s an untenable and counterproductive posture, and obviously so. So what should our foreign policy be? I think there’s only one real option right now: Our role is to stay out of these countries’ business except when it comes to helping citizens establish democratic governments that we will acknowledge as legitimate and sovereign. That’s crudely put, I know. We’ll never completely stay out of anyone’s business, because the business of all Middle East nations is intimately tied to our business. But still, it’s the essence that’s important. Egypt doesn’t need our help toppling an oppressive regime. They need our help with matters of diplomacy. We can help facilitate the process by which they will form their own government. We have the muscle to keep would-be despots at bay—telling Egypt’s military to back off, if it comes to that. We also have the expertise and third-party standpoint necessary to aid diverse groups as they create a new government, whatever help they may need. And then, at the end, we can lead the world in recognizing the new Egypt and other new democracies as sovereign nation-states. The other thing we can do? Help to spread unhindered access to the Internet and to mobile networks in these countries. The only agenda we would be pursuing is empowering people to gather information and share it freely. So what we can do in Lancaster? How do you think we should be reacting to the news from the Middle East? What’s the appropriate response from our community here in the U.S.? The cultural significance of Congress’ move to overturn “Don’t Ask, Don’t Tell” is so great that I think the comparison with Brown v. Board of Education is warranted. This should be a moment of great pride for many good Americans who have worked hard to move the national attitude so far so fast. Just seventeen years ago, in 1993, a majority of U.S. citizens opposed gays serving in the military, Mark Shields recently pointed out in his recent appearance on the PBS NewsHour. Today, there is a three-to-one margin supporting gays openly serving—75% of Americans. Among women, the support is 80%. Certainly that kind of sea change in America and in our cultural thought is gigantic and something we don’t often see. It’s positive and profound. Much of the credit goes to the small but very determined efforts of a lot of individuals and groups on the local and personal level. The courage of many individuals who do not stay in the closet but instead come out and say who they are and that they have just as many rights as any other person does has earned the respect of their neighbors. 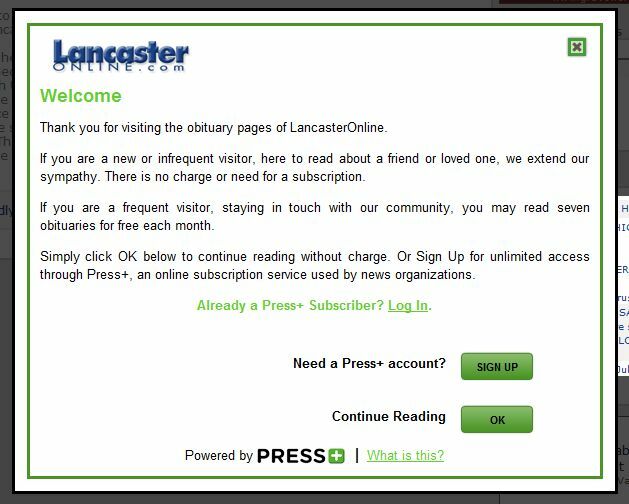 Also groups like Lancaster Pride and their annual festivals have made an impact by going far beyond saying, “We’re here, we’re queer, get used to it,” have instead sent a message of unity and love and acceptance. Their message has been that it’s important that we learn to live and work together and not just tolerate each other but love each other and respect each other. I hope that some of us straights, including straight Christians like me, have had some small and humble role in this shift. I was, for instance, deeply touched by the scenes of an Evangelical Christian man confessing the sins of the church to gay men and women at a pride festival in the excellent documentary Lord, Deliver Us From Your Followers. This kind of cultural change does not come easily and is not to be taken lightly. The cultural impact of the Supreme Court’s decision in the 1950s to overturn the segregation of public schools was gigantic by simply allowing and in fact forcing children to interact with one another. Just as the military has been a force in a similar way, creating brothers out of blacks and whites who served together, I think we’ll see a similar impact of gays and straights who serve together, and see a breakdown of this idea that manliness and homosexuality are opposing forces. One Lancaster resident whose efforts on this front I would like to single out and celebrate is Mark Stoner, who was recently recognized in the Central Penn Business Journal‘s twenty-fifth anniversary issue as one of the most influential minorities from the midstate from the past twenty-five years. Digging for fossil fuel is never safe. It’s never safe for humans, and it’s never safe for the wild areas in which we humans allow the digging. The inconceivably massive oil spill we are witnessing on the Gulf Coast should remind us of that. BP, world champion of corporate green-washing, is responsible. The corporations who dig up fossil fuel need to be watched closely by competent regulators. Regulation costs money. The corporations that make money by digging up fossil fuel should cover the cost of the outside regulators. It’s never clean. It’s never safe. It’s always risky. Pennsylvania needs regulators to protect the most basic interests of society from sloppiness of the corporations that dig up the fossil fuel here in our state. We should mandate the corporations to foot the bill for those regulators themselves.